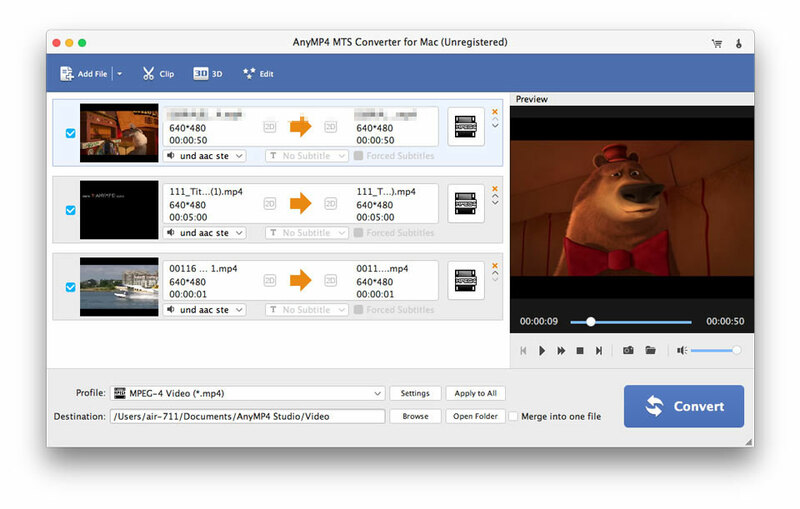 AnyMP4 MTS Converter for Mac can help you enjoy MTS video with various video players and portable devices after converting MTS, M2TS and TS video to MP4, M4V, WKV, MOV and other prevalent video formats. Apart from converting functions, this Convert MTS on Mac can also help you edit the video effect according to your requirements. Therefore, you can cut off any part of the original video, crop the video frame, merge video segments together, add picture watermark to the screen of the video and adjust the video effect by changing some parameters. With this Mac MTS Converter, you are able to convert MTS, M2TS and TS video to any video format such as MP4, MOV, AVI, WMV, MPEG, 3GP, M4V, FLV, MKV, MPEG, etc. And you can extract audios from the MTS video files and convert them to your needed audio formats. This MTS Converter for Mac can adjust the output effect by modifying the Brightness, Contrast, Saturation, Hue and Volume. And you can adjust the video/audio settings such as Video Encoder, Resolution, Frame Rate, Bitrate, Aspect Ratio, Audio Encoder, Bitrate, Channels and Sample Rate to get your preferred video/audio effect. This MTS File Converter Mac can personalize the video effect at your disposal. Thus you can trim the video to your needed length by setting the start point and the end point and crop the video frame. Also you can add your favorite words or picture on the screen of the video to add watermark. AnyMP4 MTS Converter for Mac is easy to use for the intuitive interface and clear guidance. And it allows users to take the snapshot of the preferred pictures.